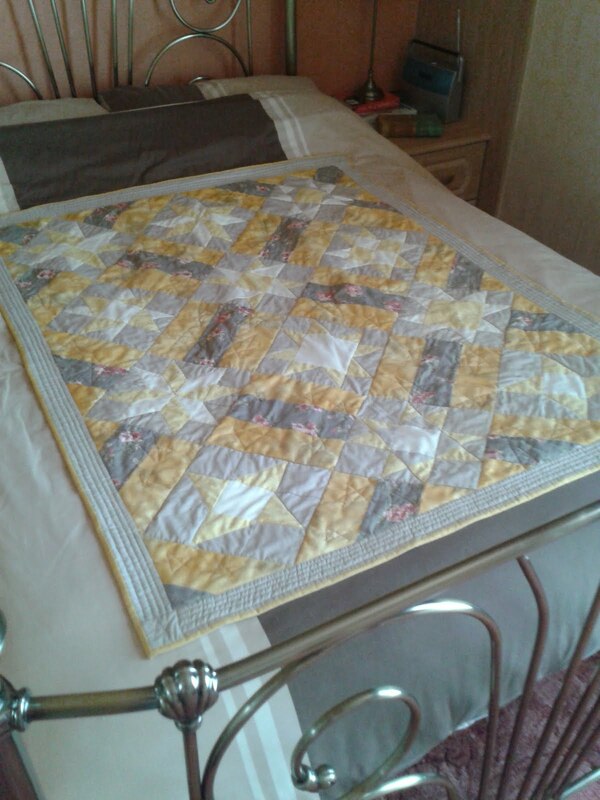 I've had an excellent couple of weeks since the December's final Christmas quiltalong - the most satisfying of which has been to actually finish the QAL quilt, Scatty Stars - hurrah! I would have posted about it earlier, but everytime I've remembered to go and take a few pics, it's been dark and artificial lights mess about with the colour balance - but here it is. Although it has been through the machine and been aired and is ready for sleeping under, before I get to snuggle up under it, it has to perform another important service - namely being round the Christmas tree tub, an idea I have cribbed shamelessly from one of the other Christmas QAL girls. Talking of Christmas, here's what I won from Sue's QAL competition - isn't it beautiful? Wonderful needlework, a lovely border, and a pocket on the back to slide a baton through for hanging. Thank you, Sue! With Scatty Stars out of the way, the next project is mum's quilt (Sue's Antique Nine Patch), so when big sister Helen was here a couple of weekends ago we all went on a shopping trip to the Cotton Patch. 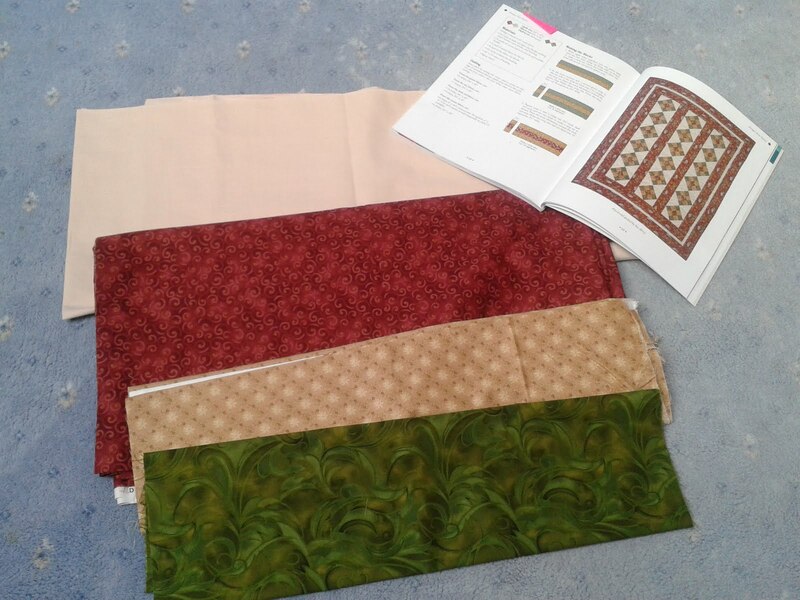 We spent a happy afternoon wading through about a zillion bolts of fabric and finding four to match up with an offcut of mum's carpet and one of her patterned curtains, and finally we all agreed on what went with what and which fabric would be used where - and now I can't wait to get my teeth into this one! 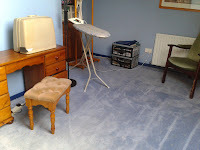 Before diving in, though, I've taken the opportunity to clear the decks in the sewing room - and it's never been so tidy. glad to see that you finished it. It is very pretty! I want your sewing room. What wonderful space. 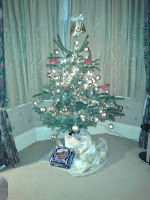 Your quilt looks great, and I think will make a lovely skirt for the tree. Merry Christmas. 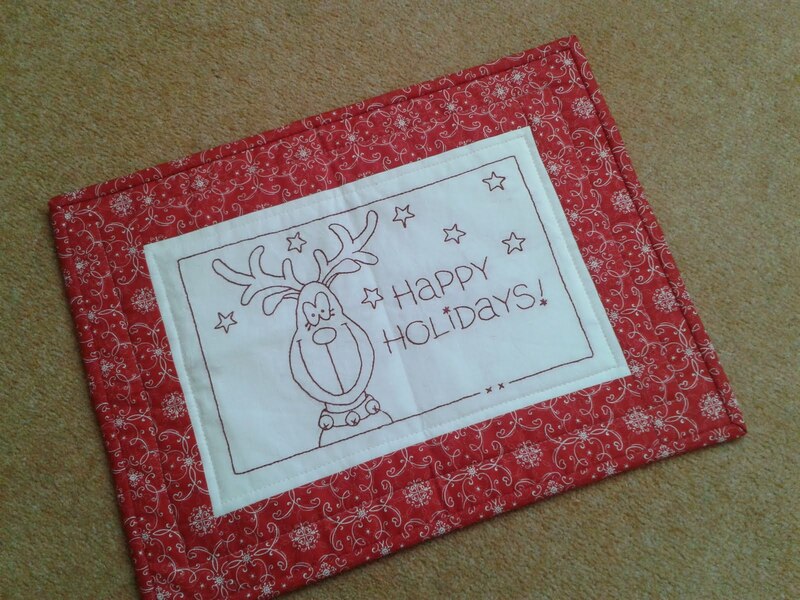 What an amazing quilting year you've had. 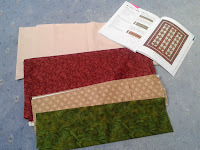 Love the choices for Mum's quilt. I've been very good (mostly) this year, so please may I have Hazel's sewing room for Christmas. I promise to be good next year too. What a nice clean sewing room! Wowwee! I tell you what though putting stuff away makes me want to start more projects! 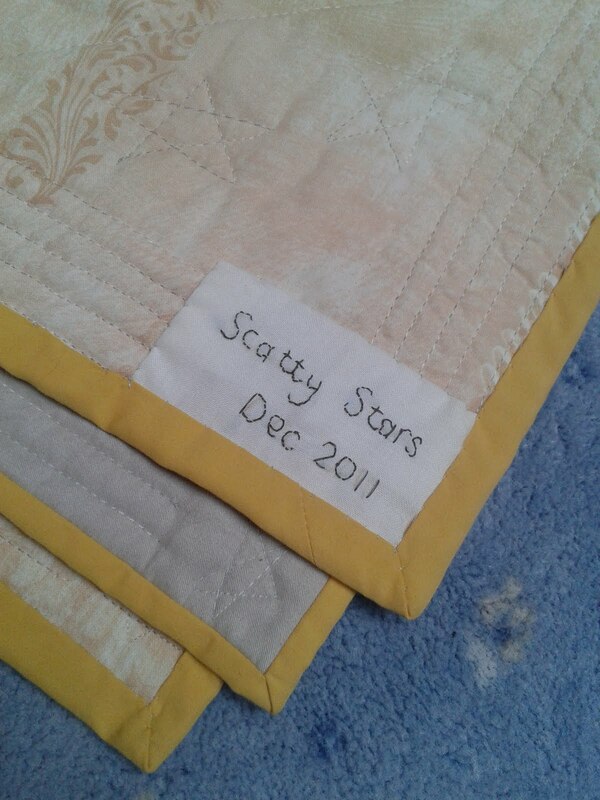 Great job on your Scatty Stars Quilt. Thank you, girls - the sewing room has never been so tidy. I will let you into a secret, though - if I had taken the photo to point the other way, it would have shown a couple of demijohns of wine on the go, an ancient stacksystem which will only play cassettes, some carpet offcuts, jars and jars of various dried beans, and a bath (not plumbing in, obviously, what do you think I am - weird? ).